If baseball is inherently a game of failure, the slog through the minor leagues can sometimes seem like a study in ignominious repetition. The long bus rides, bad hotels, and sparsely-attended games in forgettable towns: I imagine it can all start to feel like throwing a beach ball into the wind. Especially when you’re literally throwing a beach ball into the wind. That’s Single-A center fielder D.J. 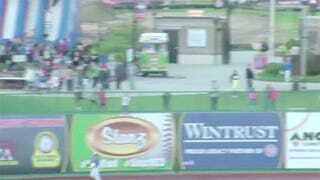 Wilson of the South Bend Cubs struggling to get an errant beach ball back over the outfield wall at a game on Sunday. His success on the 11th try is truly a lesson in perseverance.